First there was that epic profile of Roger Goodell, which was 6,000 words of Peter King trying to stuff some brains and character into an empty suit. Then there was this item the other day. I know it's CBA season, and I can only imagine how difficult and disorienting it must be for football writers to watch mommy and daddy fight this way. But we're talking about Peter King here. And it says a lot about NFL journalism — both past and present — that its most influential exponent is covering the sport from a crease in Roger Goodell's khakis. Thirty years ago at the Landmark, a bar just off the campus of Washington & Jefferson College in southwestern Pennsylvania, tension occasionally simmered between townies and college kids. Sometimes it was racial. One evening a black student walked in, sat at a corner table and ordered a beer. At the bar was a white townie who'd had a lot to drink. He ordered the black kid to scram. The bartender, a 21-year-old W&J senior, stepped from the behind the bar and stood between the two men. The townie opened his coat to reveal a revolver. "I want him out!" he said, putting his hand on the gun. "I don't care—I'll shoot you too!" "He can stay," said Roger Goodell, the bartender. "He's allowed to have a drink." Time stopped in the crowded bar. "Let's just go outside," Goodell said to the townie, and they did. 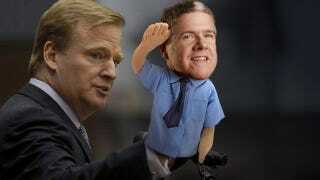 Goodell walked the patron down the street and out of the Landmark for the night. Tim Foil, one of the bar's owners, wasn't there that night but had seen such incidents before. "You never know," Foil said. "Guns, too much alcohol. Bad things happen sometimes." Seriously, that's how the profile begins: with a little parable. Level-headed diplomat brokers peace between two antagonists, one white, one black. (Get it?) Leave aside the improbability of the story, not to mention the Paul Harveyness of it all, the way every detail fairly vibrates with dumb significance. The silliest thing is that Peter King seems to think it's relevant to the NFL's current labor situation, which it would be only if the bartender had teamed up with the heat-packing townie and tossed the kid through a window. That would be an allegory. This? It's just a mildly plausible story about a bartender who escorted a surly drunk from the premises. It has nothing to do with anything in the present-day NFL, except for maybe Jerry Jones. The rest of the story proceeds in this vein, painting Roger Goodell as a man Rolling Up His Sleeves and Doing What's Best For The Game and generally being Cicero all over the place. (A less-generous reading suggests a callow nothingburger who grew up in the glow of his dad's halo and who now comes off in his best moments as a sort of Commissioner Fredo. But that's just me.) Goodell is a titan, King seems to say, who somehow floats above a brawl that he and his pals started, something King takes great pains not to say. I spoke with retired Giants GM Ernie Accorsi, a league consultant and chair of the league's committee that brainstorms ideas from the teams and from league officials, all designed to improve the game and make it safer. The committee gives ideas to the Competition Committee. Accorsi and veteran league player-personnel official Joel Bussert have looked at a lot of tape from the 1950s and '60s — an ardent fan in Iowa has some particularly old highlight films from the '50s — and reached some interesting determinations. It's the NFL Films defense, as a friend calls it. Between the midseason crackdown on "egregious" hits and this latest from Accorsi, the NFL's public strategy should be obvious to anyone paying attention: The game isn't turning players into doddering brain-damaged 50-year-olds; it's the players who are doing it to themselves, the modern ones, so unlike the fundamentally sound, safety-first men of yore. It can't be said enough: The big hits, the egregious hits, the allegedly modern hits aren't the issue. The issue is the cumulative effect of hits both big and small, of egregious hits and of many, many "routine" hits. Accorsi's concern-trolling here doesn't show an "attentiveness" to anything but the NFL's own legal liability. Joe Williams, Jimmy Powers, and Prescott Sullivan [all newspaper columnists in major markets] in varying degrees joined Dan Parker in thinking about professional football players as "hired hands" deserving whatever they could get, but while no columnist echoed Tony Morabito in calling professional football players "irresponsible kids," many of them seemed to believe in, or long for, benevolent paternalism as the proper way to run pro football. The men who owned football teams were, in fact, throwbacks to the paternalistic mill and factory owners of the nineteenth century, long since displaced by corporate ownership with its very different labor relations. The continuing acceptance of paternalism in professional football must have owed something to the cultural construction of coaches as father figures. Owners, too, were sometimes cast as kindly fathers, as in a few of William Fay's stories of pro football bums and in Edward Prell's history of "Papa Bear" George Halas and his club. Whether dispelling the illusion of benevolent paternalism or challenging patriarchal authority, players' demands for their rights as workers cast their relations with owners on altogether different terms. You see that longing for a benevolent paternalism in everything from Peter King's writing to Mike Florio's sighing over ownership's "absence of gravitas." That's what De Smith and the NFLPA are up against: not just the owners themselves, but a press corps that goes out of its way to find good faith and virtue in an ownership class that has enriched itself by avoiding either.